Does Chicken Soup Help a Cold? There may be no cure for the common cold, but if our parents taught us anything, it’s that a steaming bowl of chicken soup is the next best thing—and there's science to back that up: Studies have shown that chicken soup does indeed hold some medicinal properties. One paper published by the medical journal Chest in 1978 suggests that the healing powers of chicken soup can partly be attributed to thermodynamics. When Mount Sinai Medical Center researchers in Miami Beach fed chicken soup to 15 healthy participants, the hot broth was shown to be successful in loosening mucus and clearing nasal passageways. The heat coming off the soup may seem like a simple explanation for the phenomenon, but the rest of the study paints a more complicated picture. When pitted against plain hot water, chicken soup was proven to be the better decongestant. A 1998 report published in Coping With Allergies and Asthma would later say that chicken soup also improves the performance of cilia, the tiny, hairlike structures that prevent contagions from infiltrating our bodies. In addition to directly treating our respiratory systems, there’s data that shows chicken soup has an impact on our white blood cells as well. For his 2000 study (also published in Chest [PDF]), Dr. Stephen Rennard of the University of Nebraska Medical Center in Omaha conducted laboratory tests using his wife’s homemade soup, a recipe that had been passed down by her Lithuanian grandmother. When he studied blood samples from volunteers, Rennard found that the presence of chicken soup slowed the movement of neutrophils, a common white blood cell that fights against infection. Cold symptoms are caused by our immune system's reaction to viral infections in the upper respiratory tract. The white blood cells that flood the area can often do little to kill the virus, and we’re left to cope with the consequences of their efforts: an overproduction of mucus. 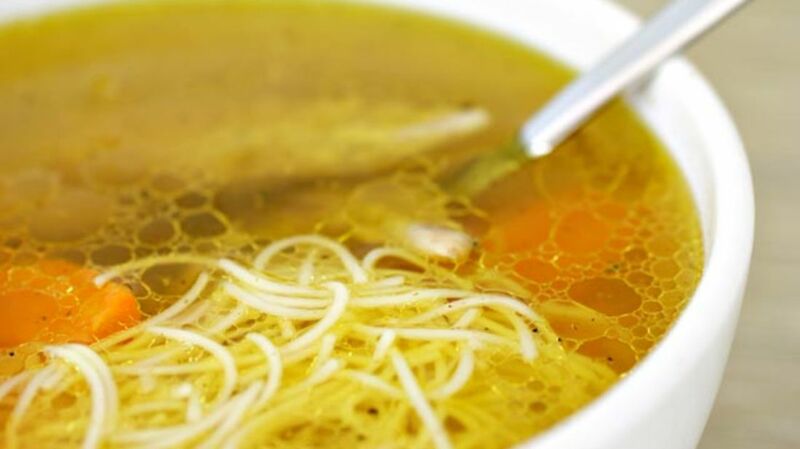 By inhibiting these cells, chicken soup actually helps ease our symptoms. Rennard’s grandmother-in-law’s recipe contained chicken, onions, sweet potatoes, parsnips, turnips, carrots, celery, parsley, salt, and pepper—but exactly which of these ingredients contributed to the results remains a mystery. According to Rennard, it’s likely a combination of the vegetables and chicken in the soup rather than a singular ingredient that’s responsible for its soothing properties. Organosulfide, a chemical that’s found in onions, consumed along with Vitamin D has been shown to stimulate the production of the immune cell macrophage, while Vitamin A and carotenoids found in carrots boost antibody production. A study published in the American Journal of Therapeutics in 2012 suggests that carnosine, a chemical compound found in the soup, could help combat the early stages of the flu. And while you can get these nutrients from sources other than chicken soup, they’re easier for your body to absorb in liquid form. If you’re feeling a bit under the weather, Rennard’s scientifically backed chicken soup recipe is available to view online. But don’t sweat it if you don’t have the energy to whip up a home cooked meal—his study showed that canned stuff like Campbell’s, Lipton, and Progresso is just as effective.